Coming from Boston, if you look left just before you turn onto the main road leading into our suburb, you'll see a staple of the community -- an ice rink known to most of us as "Ponky" (short for Ponkapoag). Like so many families in Canton, Ponky was a second home to us. Brian coached his high school hockey team there and often Teddy and Annabel sat in the scorer's box during practice while I was still at work. Just a few weeks ago, Teddy and his best buddy Liam had a joint 7th birthday party at the rink and we filled the ice with over 60 kids (including the Canton team and Teddy and Liam's youth team). After the younger bulldogs skated with their idols, we all headed upstairs to the room that overlooked the ice for pizza and cake. While everyone else probably had their most sentimental moments at Ponky down by the ice, being the nerd that I am, my sentimental space was that upstairs room. When Teddy and Annabel were babies and it was a particularly cold night, I watched Brian's games from that warm room. (I remember feeding them bottles that fell out of their mouths when Canton scored and I got excited.) These past few months, during Annabel's learn-to-skate hour every Saturday morning, I would work on my book up in that room and I completed significant amounts of editing in between my waves to Annabel who was shuffling along on the ice below. Even during Brian's games this season, I would sit up there surrounded by a bunch of kids and their Gatorades, AirHeads, and boxes of popcorn. I would type away on my laptop stopping sporadically to watch the game, try to quiet down the kids who ran laps around the space, and high-five the little lunatics when our team scored. I loved that room. I'll miss it. 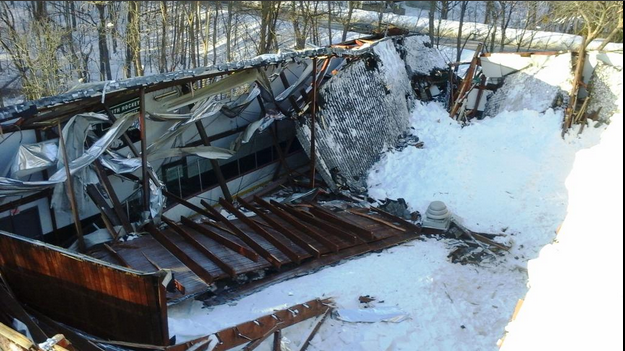 Around 7:15 yesterday morning, the roof at Ponky gave way to the mounds of heavy snow that sat atop it. Brian and I heard about the roof collapse not long after it happened and once we saw photos, we started to process it. Our most fundamental reaction was like most others' in town -- we felt (and feel) so grateful. 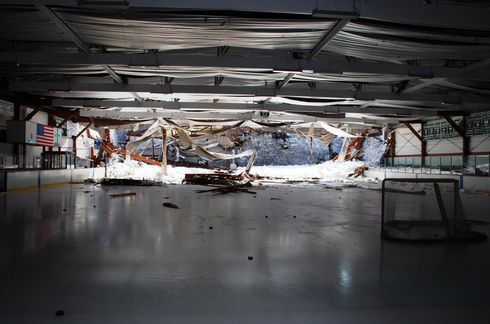 Despite that youth teams were on the ice at the time, they were not standing at the end of the rink where the roof first fell. Thanks to the heroics of the coaches, everyone escaped uninjured. Anyone who knows Ponky and how much time hundreds of kids spend there knows that it's truly a miracle. Given a fundraiser Brian and I had attended the night prior (for Canton Youth Hockey nonethless), Teddy and Annabel had slept over with their grandparents in South Boston. When Teddy overheard the news about the rink that morning, he couldn't contain himself. He was hysterical over the phone to us and Brian and I didn't even change out of our pajamas before we hopped in the car to pick them up. The poor little guy in all his Canton hockey gear, and Annabel copying him. For the first minute or so of Teddy's hysterical tears, my heart kind of broke. Then once Annabel chimed in and all hell had clearly broken lose, all I could do was laugh and snap a photo. It was so crazy that it was funny. Me: "Teddy, think of it this way -- now you might get a brand new rink to skate in one day! How great would that be?!?" Teddy: "I don't want a new wink! (Sobbing tears...) I want the owd wink va way vat it waaaas!" Me: "Oh buddy, I know. It's hard." Me: "Okay buddy. It's gonna be okay." Today we really didn't talk about the rink. Teddy started crying again when he overheard Brian and I talking about the fact that all of Brian's equipment (even including his whistle) is gone in the rubble, but his tears didn't last too long. Teddy's biggest concern today was about where his "twy-outs" will be for next year's youth hockey teams. Apparently those were set to take place in a few weeks. Meanwhile, I've thought a bit about Ponky and the reports that it's a total loss. I've tried to push out the thought that has undoubtedly crept into every Canton parent's head -- what if it had happened just a few hours later? Over a hundred five- and six-year-olds would have been on that ice. Brian's team would have been watching film in the room that was blown through by the impact of the collapse. I try to stop myself because nothing good comes from that line of thinking. And then I realize how much I've learned in the last few years -- how many examples I've seen of life changing in an instant. Of tragic things happening to good people. Of the collapse of what we always just assumed would be standing forever. I am one of many who has faced their own sort of collapse, and I'd guess others in that club would agree with some of what I have to say. Because once you've had your world collapse, you know how vulnerable you are -- how vulnerable we all are. You know, not just in your mind, but deep in your gut, that yesterday morning could have been one of the worst tragedies this town has ever seen. Here's the crazy thing, though. Once you know about that vulnerability, you likely know about something else too. You know that often, things that once felt completely broken can be repaired. You know that body parts can be reconstructed and tumors can be removed. 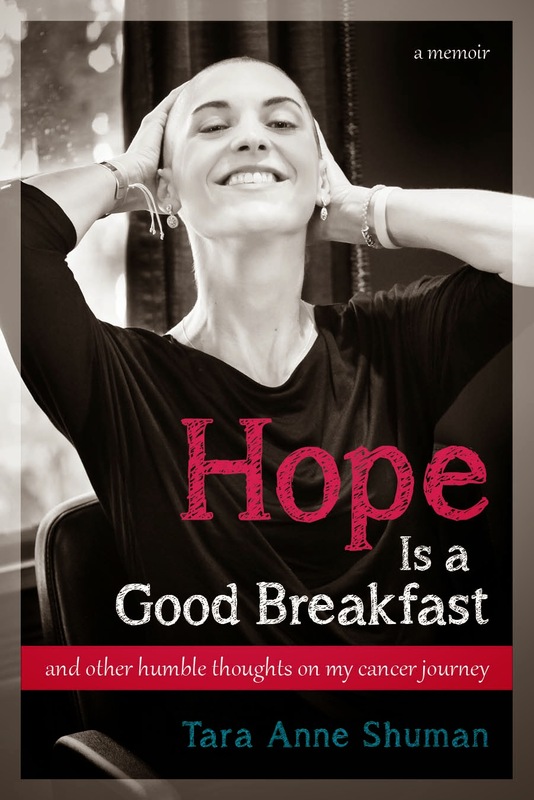 You know that metastatic cancers can shrink down to specks and that sometimes, hope alone can keep you standing. You know about resilience. Yesterday after Ponky collapsed into a mound of snow, rafters, insulation, and banners of championship teams, I was proud of so many people for so many reasons. Tonight I'll end with a thank you to just two of those people, and that's Teddy and Annabel. Because I love my seven-year-old for wanting to repair something that was broken. I love him for not giving up on the wink he woves. And I love my four-year-old little tomboy, who still can barely skate, but who has the heart and wits enough to repeat all day long that "no one was in-juwed at va wink." I love that she knew that was the most important piece of information. And I wanted to hug her and never let go every time she reminded me of it. Such a beautiful post and a reminder of what is really important.